We fit like your favorite pair of jeans. We smell like clean cotton sheets. We pitch ideas like a major league MVP. The C2 Group is a team of leading communications professionals skilled in helping you identify and better understand your target audience. We then spend time hanging out and understanding what you do and how you do it. Our work is about you; not us. We exist to help you shine and succeed. Consumer marketing. We help you get into the mind of your customer and better understand them to better reach them. Sports marketing. Looking to engage health nuts & sport fanatics? We understand what it takes to reach people with an active lifestyle and pull them in to sell your message in a compelling way that has deep, lasting impact. New business start ups. When you’re consumed with the many details of getting your new business off the ground, let us help you develop your visual branding and ensure that you make as big of an impact as you’re wanting to. Church communications. Are you familiar with the finer points of communicating to your church audience? So are we. But we know just what to do to engage them and set things up for a big impact on them. Capital campaigns & fundraising. Educational institutions, donor events, stock IPOs … we’ve had a hand in a wide variety of fundraising efforts of the years. Fuel is a sports nutrition organization that helps educate and guide endurance athletes as they train for sporting events. 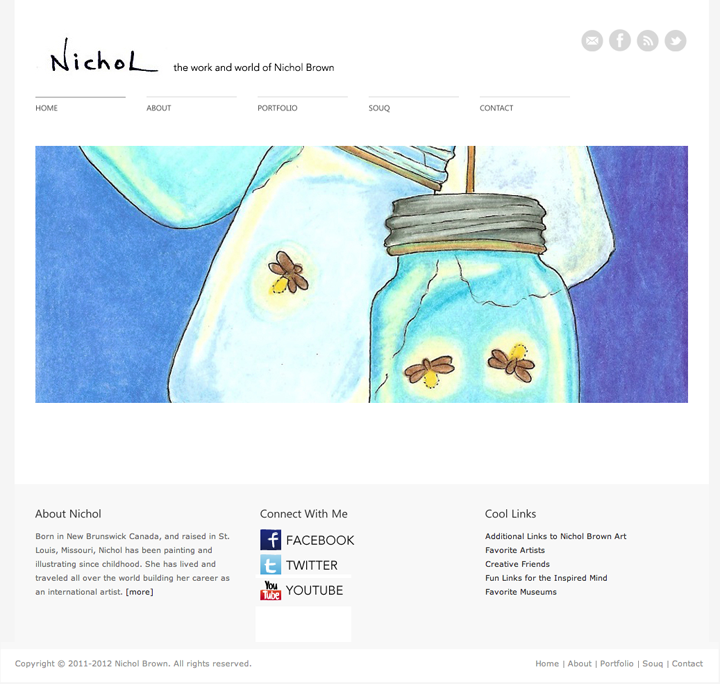 Artist Nichol Brown needed a website to feature her artwork and serve as her "home" on the internet. The site featured a minimalist design and included a vast portfolio of her work as well as a blog. 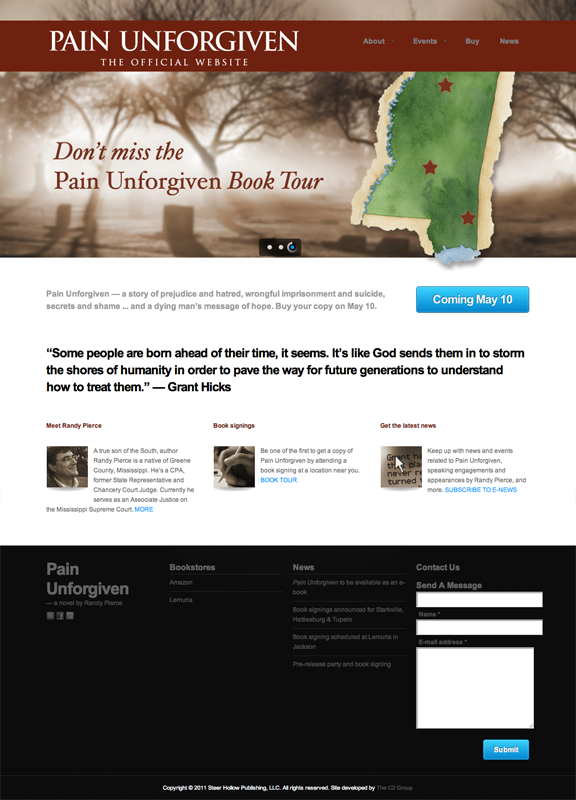 When Mississippi Supreme Court Justice Randy Pierce was ready to publish his first novel he tapped The C2 Group to design the cover and inside of the book as well the website and custom Facebook design. Dallas Cowboys linebacker Bradie James is making a real impact on lives through his Foundation 56. 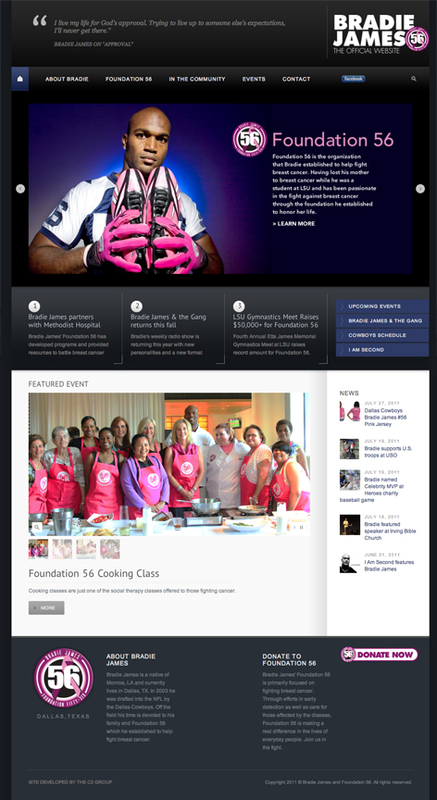 This Wordpress-based website is focused on communicating information about Foundation 56 and its activities as well as personal information about Bradie to his fans. During their 2011 season, Marathon Makeover get the fun job of driving around town spotting participants in their program and awarding fun prizes and other goodies. The C2 Group came through with an eye-catching design for their car wrap. 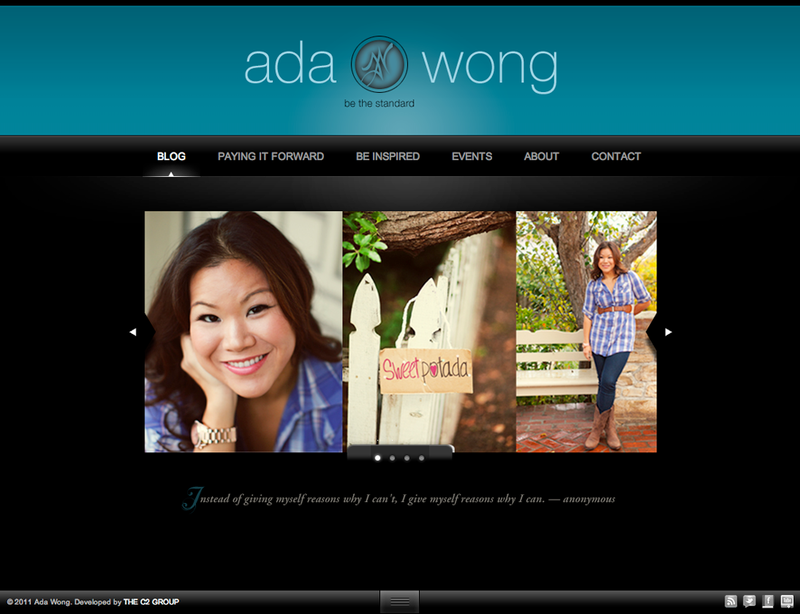 Ada Wong, finalist on season 10 of NBC's The Biggest Loser, came to The C2 Group for a personal website. The goal was to provide a simple, understated design that captured her personality. StinkyFeet Athletics asked The C2 Group to help them communicate their brand and build their image as they debuted their first advertising campaign in local media. 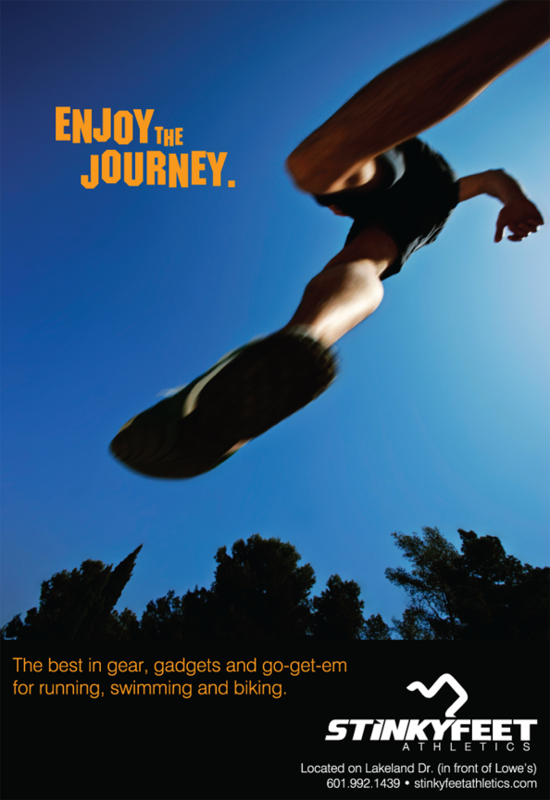 The result was eye-catching, dramatic sports images that embodied their motto, "Enjoy the Journey." 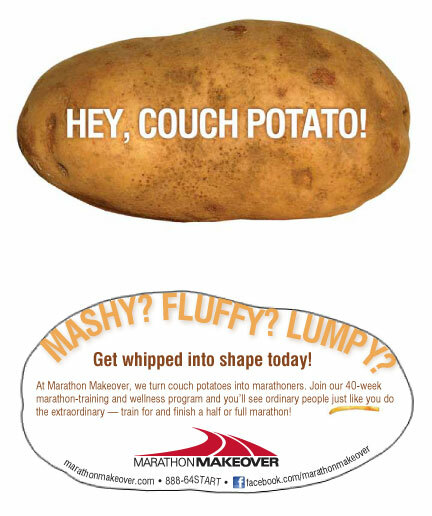 Promo card produced to promote the healthy living that joining and following the Marathon Makeover training program can bring. The work of Bradie James' Foundation 56 focuses exclusively on breast cancer. This billboard was part of their annual breast cancer awareness campaign each October. The C2 Group is led by the husband-wife team of Jeff and Kristi Christian. With over 20 years experience in marketing communications they have worked in a wide variety of industries lending expertise in both business-to-business, consumer and non-profit marketing. Before moving to Jackson in 2005, Kristi worked at the corporate headquarters of such top companies as Southwest Airlines, Mary Kay Cosmetics and Countrywide Home Loans. Jeff has worked with in-house agencies and design firms securing work for such leading corporations as Dr. Pepper/7-Up, Greyhound Bus Lines, Motel 6 and more. He also spent several years leading corporate communications for churches, most recently at Pinelake Church in Brandon, MS, ranked as one of the largest and fastest growing churches in the U.S. COPYRIGHT © 2014. THE C2 GROUP. ALL RIGHTS RESERVED.